This is the only known photo of John Garrigues. It was taken at some point between 1919 and 1925. 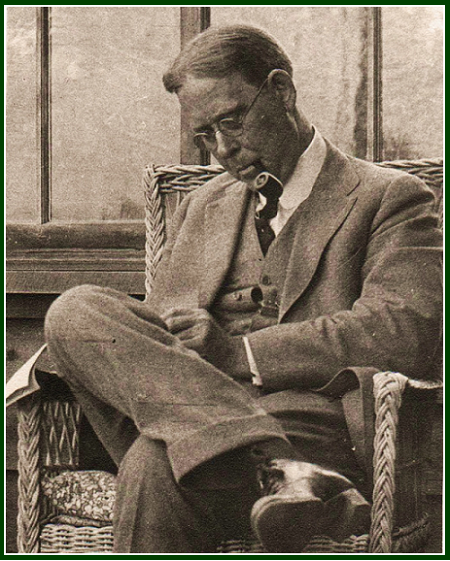 Independent research on the history of the United Lodge of Theosophists shows that John Garrigues (1868-1944) was one of the main 20th century theosophists and authors. During all his life, Garrigues kept his writings anonymous. For decades after his death his name was unknown, except to those who had met him personally or had heard of him by direct oral testimony. The silence was broken in a gradual way. Gabriel Blechman’s notes on him were published in October 2001 at “The Aquarian Theosophist”. Since 2011, our associated websites offer their readers a selection of his texts, in more than one language. The writings of John Garrigues are only partially identified. For many years he was the main editor of “Theosophy” magazine, and the short length of some of his best articles can be explained by the editorial need to supply a final article of some precise size, in order to close the edition of a magazine. As his texts in “Theosophy” were anonymous, we must share the criteria used in identifying and selecting them. 1) No fear of looking at obstacles. He presents the theosophical effort as a sacred but dangerous enterprise to be serenely understood. It is the journey of the hero, and moral courage is necessary in it. 2) A clear vision of both past and future of the theosophical movement. Having a clear understanding of the law of cycles, Garrigues shares the results of his long-term research on the effort done by Initiates. He consciously worked towards a better future, whose basic lines were known to him. 3) The facing of trials. He discusses the probationary path and the challenges which every aspirant to discipleship has before himself, as in the article “The Hour of Need” (“Theosophy”, May 1921), which is also available at our associated websites. 4) A living presence of contrast. JG examines the contradictory aspects of life, while showing also the presence of equilibrium and symmetry in every aspect of Reality. 5) An often poetical viewpoint. This is easy to find in his book “From the Book of Images”, and many of his other writings. 6) An axiomatic style. Garrigues’ articles have often short sentences ready to be meditated upon. As an example, one can see in our associated websites the article “The Key to Steadiness”. 7) A clear examination of the challenges facing the theosophical movement. JG frankly discusses pseudo-theosophy and shows how it works, paving the way for the roots of self-delusion and collective illusion to be eliminated. 8) An active defense of H.P. Blavatsky and W. Q. Judge. One of the occult reasons why such a task has a decisive importance is that the skandhas or karmic records of the founders’ lives are at the very center of the aura of the movement. Garrigues also developed a correct viewpoint as to H.P.B.’s living influence after her physical death in 1891. One example can be found in the text “How Far Away is H. P. Blavatsky?”, which is available in our websites. 9) A perception of strategic choices. The metaphor of the war and the warrior is easy to find in Garrigues’ writings. One example is the article “The Law of Retardation” (“Theosophy”, November 1920) – which is published at our associated websites. Another one is “Survey of the Armies” (“Theosophy”, August 1922). Classical use of the Warrior metaphor can be seen in the “Bhagavad Gita”, the “Mahatma Letters”, W.Q. Judge’s text “Hit the Mark”, and in the writings of H.P. Blavatsky – besides the New Testament (Matthew, 10: 34) and other ancient and modern texts. 10) An observation of personal motives. JG studies the emotional alchemy necessary to make real progress along the way. He gives useful hints as to developing, strengthening and purifying one’s spiritual Will. His motivational articles are typically short. Other factors may be added to the list. Among them, the choice of words, style, rhythm of sentences and mantramic elements present in contents and form. Since the 1890s the theosophical movement has remained unnecessarily small or grown in wrong ways. The vitality of the movement depends on the inner motivation of its members. One of the stumbling blocks consists of a pair of opposites: on one hand, there is the illusion of personal ambition; on the other hand, the illusion of personal lack of motivation. The paradox results from an absence of proper information regarding the nature of the movement. Well-informed people see Theosophy as both stimulating and realistic, challenging and sober. Philosophical knowledge must be open to critical examination. The theosophical Pedagogy may be defined as the art of independently researching and teaching esoteric philosophy. One can see how it works by studying “The Mahatma Letters” and “Letters From the Masters of the Wisdom”. The Letters show how the pedagogical principles followed by Initiate Teachers can be applied in daily life. John wrote a book with fictional stories transmitting theosophical wisdom. It was published three years after his death, under the pseudonym of “Dhan Gargya”, and with the title of “From the Book of Images”. Garrigues’ book of tales deserves careful study: in some of its stories he seems to have introduced minor difficulties to the text, so as to get the right kind of attention and concentration from the reader. By developing full attention one has access to the deeper meaning present in between the lines. Working in silence, Garrigues played a key role in the preservation and the spreading of true theosophy during the first half of 20th century. 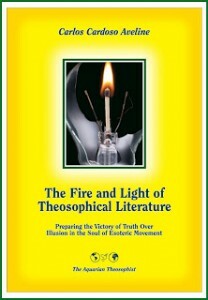 Jerome Wheeler – the lifelong theosophist and editor who in 2000 founded “The Aquarian Theosophist” – sent us on 9 June 2005 a valuable account of John Garrigues’ trajectory. “I never met him so can only tell you second-hand”, Jerome wrote. Before writing down his narration, he had gathered from older students and from the ULT Archives in Los Angeles basic and precise information on the life and work of Garrigues. “John had only one arm”, JW writes. “When young he made exuberant plans to study in the West Point Military Academy, but had an accident during a hunting trip and his arm was amputated.” Karma has its own ways to prevent one from doing things to which “the door is closed”, and not all of such means are easy to deal with. Born under the zodiacal sign of Virgo, Garrigues was a hard-worker and had a practical, down-to-earth, organized view of life. The words “deep esoteric studies” are a reference to that which can be called “second section of the theosophical movement”. In the early years of the theosophical effort, the “third section” was its public work. The members of the “second section” were either regular disciples, lay disciples, or aspirants to discipleship. The First Section was composed exclusively of high initiates in occult sciences or esoteric philosophy, that is, Adepts. That means in the first years the Adepts or Masters were actual members of the movement. John Garrigues and his wife were part of the pioneer group of inner studies in 1907, which would flourish as the ULT from 1909. When they helped create this deeper level of studies, in July 1907, Garrigues was 38 years old, and Crosbie was 58. Starting from 1909 and up to Robert Crosbie’s death in June 1919, Crosbie and Garrigues were the two main leaders of the United Lodge. Due to his relationship with literature, Garrigues played a key role in the founding of “Theosophy” magazine in 1912, and in its editorial work. Most theosophists have to be active in the world of forms, as well as in the world of inner reality. Garrigues found it easy to deal with the external world and dedicated all his abilities to the theosophical Cause. He could raise considerable amounts of money, and his example is not the only one along that line. Indian leader Mohandas Gandhi wrote in his Autobiography about his friend Raychandbhai, who was known as Shatavadhani, or “one having the faculty of remembering or attending to a hundred things simultaneously”. Garrigues had a similar ability regarding apparently contradictory factors such as universal wisdom and money exchange, or right physical plane memory and deep contemplation. He helped build the United Lodge in its inner and outer aspects at the same time. Garrigues did pay attention to efforts to minimize the work of leaders by reducing them to the image of some personal imperfection. JW says J. Garrigues “delivered the ULT Sunday evening lecture in Los Angeles every week until two years before he died, in 1944”. North-American theosophist Gabriel Blechman knew Garrigues personally, and was the first to write a public testimony on him. He reported that Garrigues was known to friends as “JG” and to young people in Los Angeles as “Uncle John”. John Garrigues died May 24, 1944, at 8:15 p.m. By then the result of the Second World War was clear and the triumph of democracy could be seen already as inevitable. The victory of the United Nations against Nazism was declared in 1945 in the same day and month when, in 1891, H. P. Blavatsky had ended her mission: the 8th of May. In the year of 1945, a cycle of seventy years was completed since the creation of the theosophical movement in 1875. With the victory of democracy, the United Nations headquarters was established in the same city where H. P. B. had founded the theosophical movement: New York. However, as the decades went by after Garrigues’s death in 1944, the ULT slowly lost much of its vital energy and its ability to renew itself. “The Right Motive” and “The First Step to Take” are easy to find at our associated websites. In another short article, Garrigues makes a thorough examination of the problem of despondency and the alternatives to it. Its original title is “The Dead Time”. It was first published at “Theosophy”, December 1920, pp. 46-47. It can also be seen in our websites under the title of “The Energy of Light and Hope”. “Point Out the Way”, by John Garrigues, is a typewritten and mimeographed / photocopied text of 211 pages which reproduces stenographic notes taken at informal talks on the book “The Ocean of Theosophy” by W.Q. Judge. The talks were delivered in the early 1930s at the Los Angeles Lodge of the United Lodge of Theosophists. The book can be found online at the website of the Phoenix Lodge, U.L.T. “The Theosophical Movement – 1875-1925” (anonymous author), copyright 1925, E. P. Dutton & Company, 705 pp., USA. See in our associated websites the collection “The ULT Day Letters, 1931-1960”. “From the Book of Images and The Book of Confidences”, The Cunningham Press, Los Angeles, California, 1947, 192 pp. The authorship of “From the Book of Images” is stated by Mr. Dallas TenBroeck in the Files which he shared with friends in 2006. Internal evidence in the text of the work also clearly points to J. Garrigues. On the three sections the Movement had during its first years, see the letter by HPB, addressed to Monsieur Charles Fauvety and published in Paris at “La Revue Spirite”, November 1880 under the title “What is Theosophy?”. It is included in English in the “Collected Writings of HPB”, TPH, volume II, pp. 500-501. Such a letter, it must be said, is not the article which had been written and published by HPB under the same title – “What is Theosophy?”- in “The Theosophist”, India, in October 1879. Also on the existence of the three sections in the movement, see “The Theosophist”, India, April 1880, p. 180, item X and others; and “Rules and Bye-Laws [of the Theosophical Society] as Revised in General Council at Bombay”, February 17, 1881, in “The Theosophist”, Adyar, June 1881, Supplement, especially item X. In a book published in 2009, Donald J. Trump ascribes to this function of mind the name of ‘multilevel focusing’. While discussing the nature of creative consciousness, Trump says: “The intersecting of ideas is when innovation will follow – thinking in musical terms while listening to your windshield wipers, or thinking of a hotel tower and condominiums at one time, or maybe watching a stone roll and imagining a wheel. Who knows what will result? Sometimes it will be fantastic and other times it won’t, but it gets the mind working in new dimensions that can sometimes prove fruitful. This can also happen without deliberately attempting to be innovative, so the other technique to employ – consciously and unconsciously – is to keep an open mind.” (“Think Like a Champion”, Donald J. Trump, with Meredith McIver, Da Capo Press, 2009, USA, 205 pp., see p. 08.) What Trump says about the action of an open mind is related to the ability to observe the world from the point of view of the Law of Analogy, which is discussed by Helena Blavatsky in “The Secret Doctrine” and other writings. “Theosophy” magazine, Los Angeles, May 1938 edition, pp. 335-336. “B.P. Wadia, a Life of Service to Mankind”, by Dallas TenBroeck, an article published at our websites. See the paragraphs under the subtitle “1922-1927”. “The Leadership of Example”, by John Garrigues, in our websites. Published for the first time in “Theosophy” magazine, Los Angeles, December 1939, pp. 69-71. From the individual message dated 5 December 2005, item three. “My Memories of John Garrigues”, an article by Gabriel Blechman, available in our associated websites. The above article was published in August 2012 and updated in September 2017.